Possibly related to the NX. Possibly not. Isn’t this a fun game? Nintendo is constantly filing patents. Patent, patent, patent – that’s the Nintendo way. Most of them never bear fruit – but some few of them do, and so we’ll dutifully report whenever they crop up, on the off chance one of them ends up being a core component of the NX or whatever. Anyway, today’s patent was filed in Japan in 2014, and in the US in late 2015, but has only just been published. Gamespot dug up the details and reports the key feature is the handheld’s vibration and speaker capabilities. This would allow developers to make it seem as if sounds were coming from behind or to one side of the player, which has some interesting AR possibilities as well as just making for a richer sound experience. 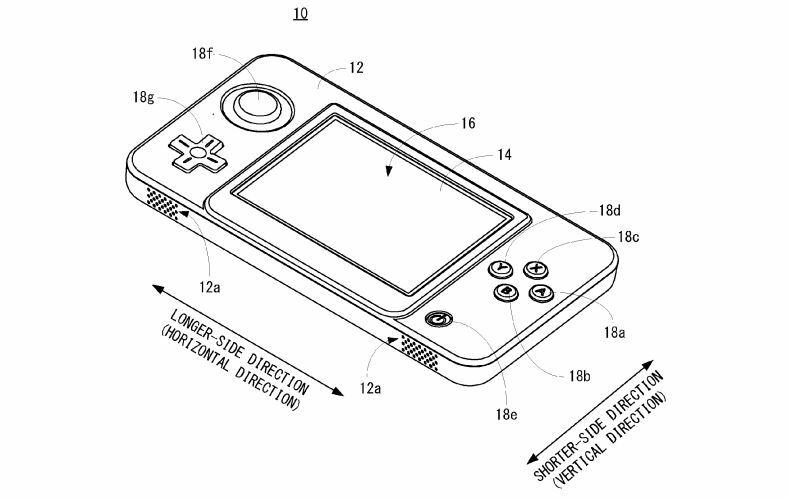 The attached images look a lot like a sort of 3DS, with circle pad, D-pad and face buttons as well as a touch screen – but given the patent isn’t related to the controls and design that doesn’t mean Nintendo is necessarily thinking about sticking this system in a 3DS, or that its next portable will look like a 3DS. Or that it will ever use this idea at all. The Nintendo NX is due for release in early 2017 but Nintendo refuses to talk about it because it has some top secret idea. Console as base-station for room-scale VR? Vibrating console that doubles as cinematic surround sound system for your living room? Console that can also make toast and call you “sweetheart”? Could be anything, hey.